Now that school has been out for two weeks (where does the time go? ), I thought I’d take just a few minutes to reflect on the transition that was made in my way of thinking about the eighth graders between September and May. To be perfectly honest, when I first arrived at this new job placement in September, some of the older students were intimidating. To be fair, I didn’t know what I was stepping into or what kind of students I would be working with. I didn’t know their backgrounds, what kinds of families they came from, or, perhaps most importantly, what kind of paths they were on. But, eventually some things started to evolve. In my initial days as a full-time volunteer at this K-8 school in East Saint Louis, I didn’t know my place and so I felt most comfortable spending my time assisting with the Kindergarteners, 1st graders, and 2nd graders. I suppose it was a few months before I began the transition of spending more time with some of the upper grades. I became comfortable with the 3rd, 4th and 5th graders pretty quickly, because honestly, that is a pretty cool age to be. Kids between the ages of 8 and 12 are not yet in the throws of adolescence, and yet, they’re coming into their own enough to the point where their personalities and simply who they are as people is starting to BURST out of them. By February, I was heading the after school program on Mondays and Tuesdays, and had the opportunity to spend a large amount of one-on-one time with every age group, including the eighth graders. Although much of my time was spent with the kids in K-5 through the winter and spring, the general amount of openness the older kids had toward me (and I toward them) had shifted since the fall. Everything came full circle for me when I was asked to chaperone the eighth grade end-of-the-year retreat in late May. Reluctantly, I accepted the offer, but honestly didn’t want to spend ten hours with 14-year-olds. 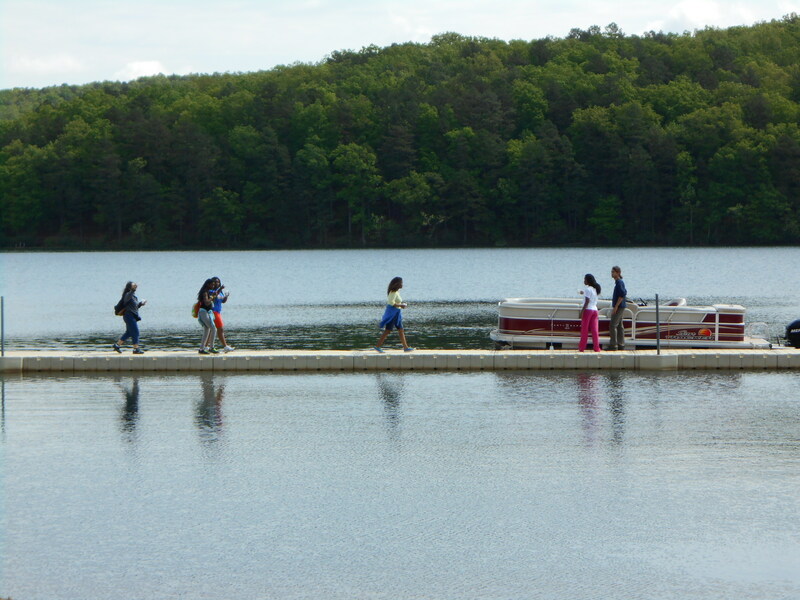 Nevertheless, I soon found myself at a remote lake/camp in Missouri with all 17 eighth graders. Slowly, throughout the day, as I spent time riding bikes, playing basketball, and cruising around on a boat with the kids, I started to see who they really are. In the very beginning, I saw them as reckless young adults –people who I had no interest in getting to know and who I would much rather have just stayed away from. Then, as the year wore on and some of them got into mischief in class and around school, my viewpoint changed, and I thought of them as immature kids in adolescent bodies. Even then, I did my best to stay out of their way. But, all at once, over the course of those few hours at the lake, and mixed with a few conversations with them, I realized just who they are…they are eighth graders. I chuckle at the thought of realizing the eighth graders are eighth graders just in time for them to move on to high school and become ninth graders. But alas, coming to this conclusion at the end of the year is perfect. It brings closure to what otherwise was simply a confusing matter. In the end, I’m glad the kids are mature enough to be headed to high school, but not yet to the point where they need to be intimidating. It means that they’re right where they need to be. They have senses of humor, respect for authority, and dreams that they’re each trying to live out. All in all, I think they’re going to be OK. Although things are at peace in my mind when it comes to these young teenagers, I’ve also taken every hint in the book — that I’ll be pursuing teaching with younger students in the near future, not the older ones. This entry was posted in Midwest and tagged acceptance, East Saint Louis, Eighth Grade, Graduation, growth, illinois, learning, Midwest, school, tolerance. Bookmark the permalink. Interesting perspective. Emily also favors working with middle school ages. Also, the younger kids are perhaps more reachable and teachable.